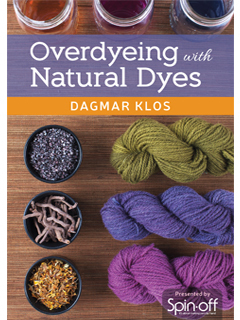 Join dye master, Dagmar Klos, as she teaches you how to produce a full range of hues and tones by overdyeing fibers and yarns with natural dyes! Learn how to overdye with natural dyes! Just as primary colors—blue, red, and yellow—combine to produce the rest of the color wheel, natural dyes can be combined and modified to produce a full color palette. Building off of principles discussed in Dagmar Klos’s companion workshop Natural Dyeing, in this video, she will demonstrate how to create a full range of hues and tones using the process of overdyeing. By dyeing fiber or yarn multiple times with varying colors, you can create new and vibrant results that aren’t possible with just one dye bath. In her relaxed and engaging style, Dagmar shows you how easy it is to use natural dyes and gives tips and techniques to get exactly the color you want through overdyeing. With Dagmar’s experience and Mother Nature’s palette at your command, you’ll soon be off on your own natural color adventures. Learn everything you need to know about natural dyeing and overdyeing in this 62-minute video workshop hosted by Dagmar Klos!